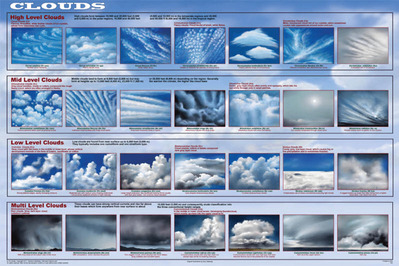 Aviation Poster – This Clouds Poster is a great gift for pilots, or anyone interested in cloud formations. Part of pilot training is learning to recognize certain cloud formations. As a general aviation pilot it is extremely important to understand cloud formations so “a go or no go” decision can be made. This poster is also ideal for any FBO or flight training center. Pair the Cloud Poster with our Basics of Flight Poster to complete the set. Our laminated Clouds Poster has the same high quality standards that are used to produce expensive art prints. The poster paper is heavy and hard in order to preserve tiny details, and provide a crisp detailed look for the images. Poster size is about 24" by 36" and the poster arrives rolled in a plastic sleeve.